Shakirah Harrell, welding instructor at Tulsa Welding School – Houston, is just 12 weeks into her time at our new Texas campus. 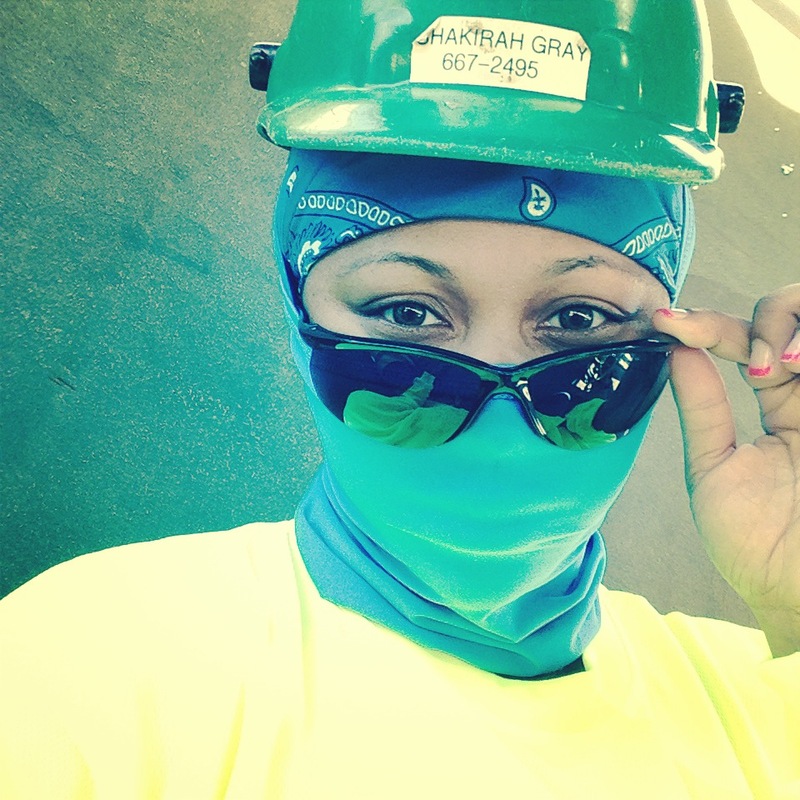 Born in New Jersey, raised in North Carolina, with the last 11 years spent in Virginia, Shakirah is a mom to three and a firm believer that women bring class to the trade! When did you get into welding Shakirah? I’ve been welding for going on 12 years now. My background is in shipbuilding and submarines, so I used to work on a lot of the bases in Virginia. I was a young mom with three kids, including a new born, so I needed a good income. Everyone was working at the Northrop Grumman shipyard in Virginia. So I applied and got a welding job. I welded for a year, and was then accepted into the Northrop apprenticeship program. It’s a four year program; I got to learn the trade hands-on and got paid doing it. I graduated in 2008. IS TWS your first teaching job? But then you came back to Houston? Yes. I knew I could always visit home, but there weren’t as many opportunities for me back there as there are here, so I loaded up my truck and came back to Texas. About a week later, I started at TWS. As a girl, what did you want to do when you grew up? I really didn’t know; I just knew I was good with my hands and good at taking stuff apart. I was a real tomboy; I went to school in the city, but I’d spend summers in the country with my uncle taking motors out of cars and playing in the pig pen! I’m a motorcycle rider; just by looking at me people wouldn’t be able to tell that. But then they don’t think I’m a welder either! Here’s something people wouldn’t know…I have third degree burns from my knees to my toes. I got scalded by hot water when I was about three. I had to learn how to walk again. I’m an R&B girl. I do love a variety, but mainly 80s/90s R&B. I do like country, but more the old Reba McEntire type country. When it comes to my favorite movie, they’re going to laugh at me… I’m a “Gone with the Wind” chick! I love that movie – Scarlett O’Hara, that’s my girl right there. I could watch her all day long, she was something else. And as for favorite book, I’m a Donald Goines fan. He was an urban fiction author from Detroit, MI. I’ve never thought about that. I’d have to take it right back in time and go with a group of people…the Ancient Greeks. I’ve always been fascinated by them. I’d love to go to one of their parties, that would be wonderful. I’d put on some Greek sandals and a toga, and party! They knew how to have a good time! You mentioned your kids; tell me about them and are you married? I’m happily divorced now! I have a 21 year old son, Ty, who’s in the Navy. Stephon, my 16 year old son is currently working two jobs, and is all about trying to get into college. Ziasia, my 11 year old daughter, is a gamer; it’s tough to get her outside! 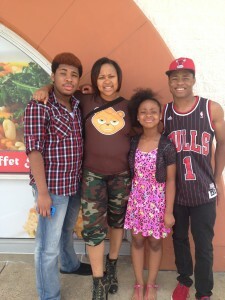 My eldest is obviously grown and doing his own thing, but the other two are back with my mom in Virginia. Stephon will be a Senior next year and wants to finish high school out there, but Ziasia will be here with me once school is finished, and I get an apartment. I would travel to Egypt, to Italy, to Australia. I would travel all over the world just to see some of the stuff in the history books. Egypt would be my first stop; I want to see the desert and the pyramids! I plan to go there at some point. I always look at welding as being a form of art, so I would tell them to be confident in your work, in your art, and believe in yourself. Students may be doing this program later in life, or they may be straight out of high school, but it doesn’t matter. Just be confident in what you want to do. Make your mind up and go for it; I’ve always been like that. Don’t second guess yourself once you’ve made your decision. As a female welder, what advice do you have for other women considering this program and career? I would like to let the women know that’s it’s no longer an exclusively male field. We are coming, we are making our way and we can do the same things the men do – except we do it with more class! We make welding look pretty darn good if you ask me! If you’re confident in yourself as a woman, you can do this trade. It all comes back to that confidence. I’ve been doing it for 12 years, and don’t get me wrong, it’s been hard because there’s a lot of competition, there are a lot of “good ole boy” attitudes out there. But once you get over that, and gain their respect, which you will if you have the skills, it’s an equal opportunity kind of job. Why do women make good welders in your opinion? I believe that women have more finesse when it comes to welding. We look at things differently to guys. A lot of the guys like to compete against each. A lot of the women that I’ve met in the field, we’re more about fine tuning the weld, getting the details right. I would encourage more women to try it; there’s a lot of money to be made out here! I like the fact that I can see a Navy commercial on TV, and realize that I’ve welded on those ships and aircraft carriers. There’s one commercial that features the carrier CVN-77, the USS George H.W. Bush. I get a lot of self-satisfaction knowing that I spent four years of my life welding on that carrier. There’s a great deal of pride in knowing that military lives depend, in part, on my welds. I guess my welding hood. You can have all the grinders and stingers in the world, but without that protective hood you can’t do anything, you’re helpless! That would have to be a guy named William Wade. He was one of my co-workers and then I became his boss at the other school I taught at. We bumped heads really bad, but once I got an understanding of him and he got an understanding of me, we became really good friends. I would listen to any advice that he has for me any day. He’s retired Navy, welded for over 27 years, and to this day I still call him. Depending on the weather I’d jump on my motorcycle and ride out into the country. I like to shoot pool too; I carry my pool stick with me everywhere. I think I’d want the ability to read minds! When you’re welding, a lot of thoughts go through your head. You put that shield down, and people don’t talk to you too much, so you have a lot of time to think.